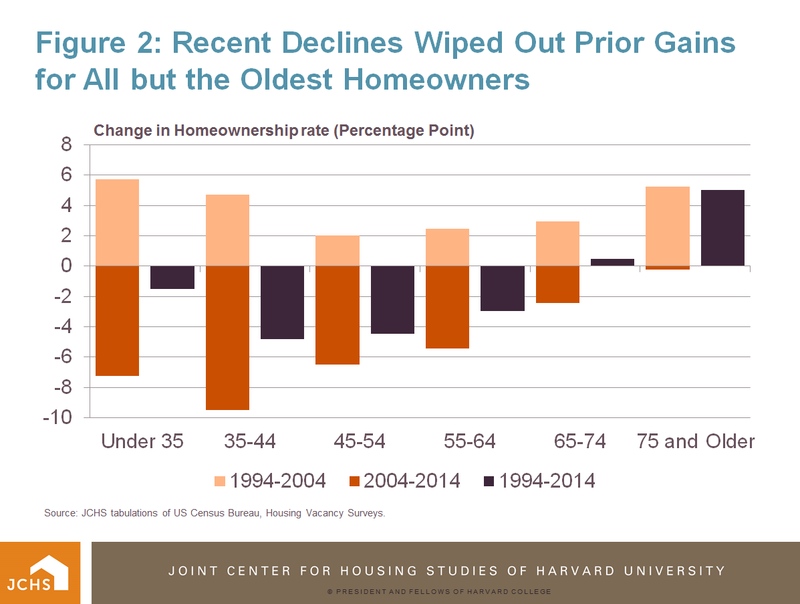 Housing Perspectives (from the Harvard Joint Center for Housing Studies): Are Baby Boomers Propping Up the Homeownership Rate? Are Baby Boomers Propping Up the Homeownership Rate? The US homeownership rate peaked in late 2004 and has been in a steady decline ever since, dropping 5.5 percentage points, according to the Housing Vacancy Survey. Annual homeownership rates for 2014 were back down to 1994 levels, and the quarterly homeownership rate fell another 0.3 percent in the first quarter of this year, bringing it down to 63.7 percent, the lowest level since 1993. 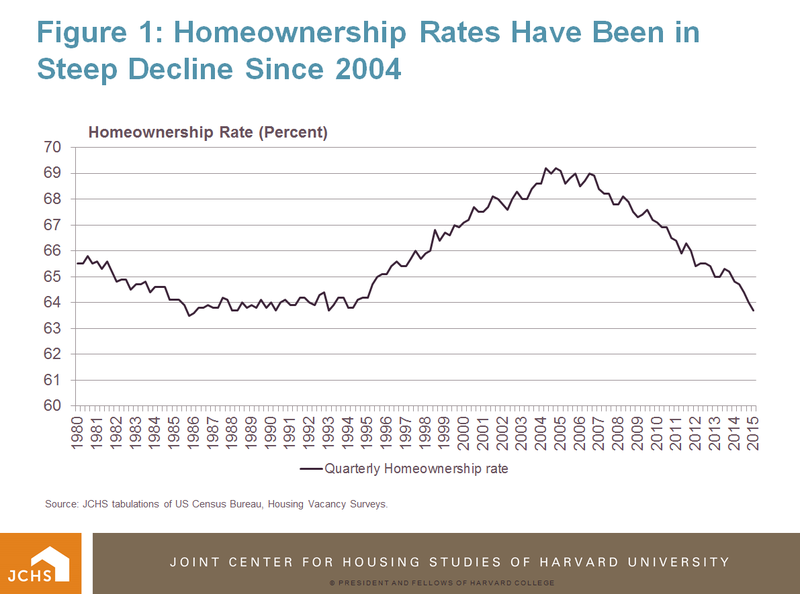 Homeownership rate declines have been most dramatic for young and middle-aged households. Homeownership rates for households aged 35-44 have dropped fully 9.5 percentage points since 2004, while those for households younger than 35 (the prime first-time homebuyer age group) have also declined by 7.3 percentage points. In all, recent declines have more than negated the gains in homeownership rates made by all 10-year age groups of households younger than 65 since the previous low in 1994. Meanwhile, homeownership rates for households age 65 and up, already higher than most other age groups, grew by 2.5 percentage points in the 1994-2014 period. With such large declines in homeownership rates among younger age groups, the decline in the overall US homeownership rate could have been worse if not for the significant aging of households, which has moved larger shares of households into older age groups that have traditionally higher homeownership rates. Indeed, as baby boomers have aged, older cohorts swelled, while the smaller baby bust shrunk the number of middle-aged households. While the millennial generation is already larger than the baby boom was at similar ages, a sizeable share of millennials are too young to live alone (the youngest were born in 2004), and the household formation of older millennials has been delayed by high unemployment and low incomes. As a result, households aged 65 and older represented nearly 36 percent of household growth from 1994-2014. Their homeownership rates were already above 70 percent even in 1994 and have remained more stable during this time period. An additional 55 percent of household growth came from households aged 55-64. Though these households saw homeownership declines from 1994-2014, they typically have high homeownership rates (nearly 80 percent in 1994 and still 76 percent in 2014), so the growth in this group pulled up the average homeownership rate. In fact, if the age distribution of households today matched the younger-leaning distribution of 1994, the age-specific homeownership declines of the last decade would have resulted in nearly 5 million fewer owners and a national homeownership rate 3 percentage points lower than where it stood in 2014. 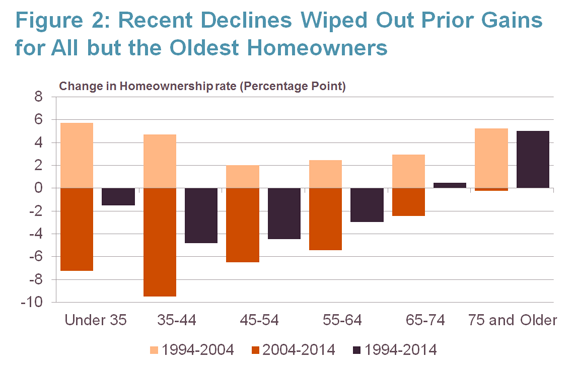 The aging of the population has been an important buffer against the homeownership declines of the last decade, but it cannot be a prop forever, as eventually baby boom households age into their 80s when homeownership rates begin to decline. And aging’s positive effects on the national homeownership rate will be more muted if homeownership rates among middle-aged households of the future are lower than those of the baby boomers at similar ages. 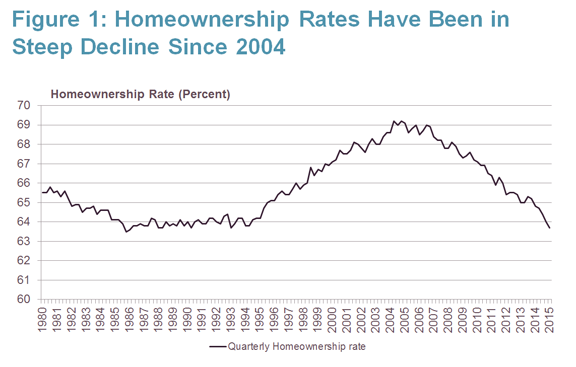 Furthermore, it remains unclear how much the homeownership rates of younger households will recover. According to Fannie Mae’s National Housing SurveyTM, the desire to be a homeowner remains a common goal, particularly among young renters, 92 percent of whom report hoping to own one day. But renters of this age also express concern that their finances are holding them back: 42 percent believe they cannot afford costs related to purchasing a home, including the downpayment, and 47 percent think they have insufficient credit to obtain a mortgage. Those with student loan payments (which account for 42 percent of young renters) also fear they have too much existing debt to take on a mortgage. Recovering economic conditions should allow more millennials to form their own households, but it is difficult to say to what extent they will be able to enter the homeownership market. Additionally, the growing minority share of households, particularly among millennials, will create some headwinds in the return to higher homeownership rates. 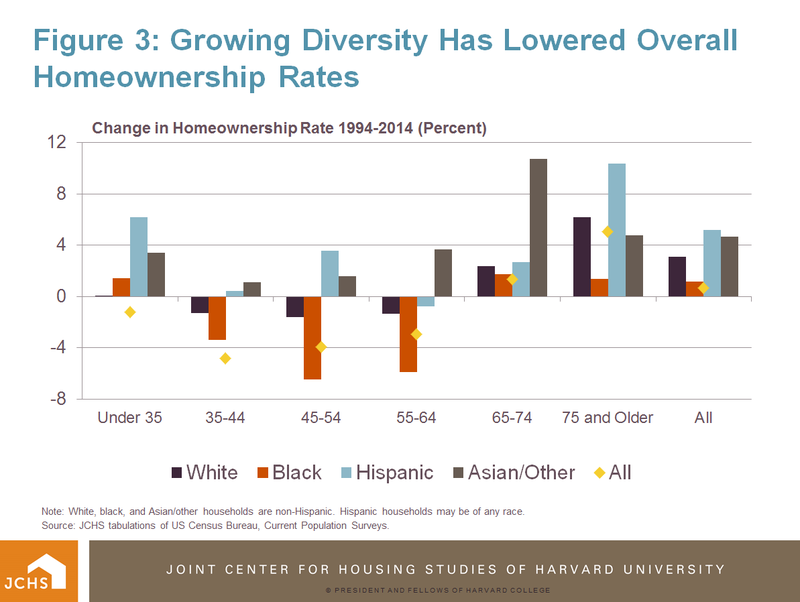 Because minorities have historically lower homeownership rates, as they become a larger share of all households homeownership rates will decline unless their homeownership rates increase. 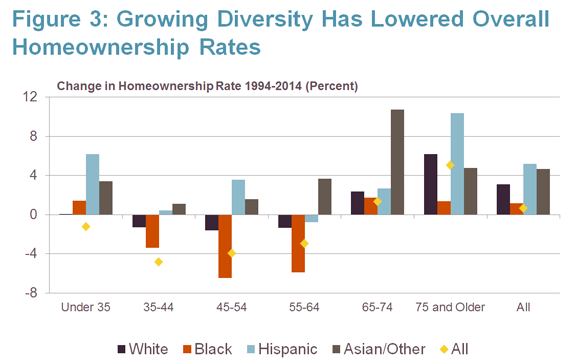 For example, even if homeownership rates by racial/ethnic group had remained constant from 1994-2014, the increasing minority share would have resulted in a homeownership rate 2.5 percentage points lower than what actually occurred. Within age bands, increasing minority share resulted in steeper homeownership rate declines among younger households and muted homeownership gains for those 65 and older. Note: White, black, and Asian/other households are non-Hispanic. Hispanic households may be of any race.